Fiberglass doors are a great way to increase the value of your home. If you are looking to resell, increase your curb appeal or simply in need of a change to beautify the overall appearance of your home, fiberglass doors can add style and class to your home and are energy efficient as well. Below are some reasons to choose our stylish fiberglass doors for your new construction or home improvement in the Edmonton area. Energy Efficient: Fiberglass doors offer five times better insulation than wood doors so they will greatly reduce your energy costs. Fiberglass doors come complete with a high performance mechanism which is superior in providing energy efficient, security and insulation throughout any type of weather. 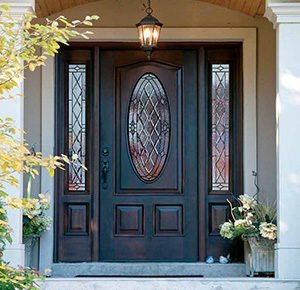 Added Home Value and Decor: With a wide variety of designs available, fiberglasses doors are quickly become a popular choice amongst homeowners. They can be stained or painted to fit your preferences. Fiberglass doors offer both increased curb appeal and superior performance. Long Lasting and Durable: Our fiberglass doors are much more strong and durable than traditional wood or steel doors. They will last for years thanks to their superior design. Fiberglass doors are manufactured to withstand the elements as well as dents and general wear and tear. They will not rust, rot, warp, bow, twist or deteriorate. You will be able to enjoy your stylish fiberglass doors for years to come. Our top-of-the-line selection of fiberglass doors is manufactured with the most advanced technology. The inside panel is carefully designed from durable reinforced wood covered by superior fiberglass on the exterior. We inject polyurethane foam in the core to achieve five times the insulation of wooden doors. Due to their unique design, our doors are manufactured to last for a long period of time as they are able to resist drastically hot and cold temperatures. Their superior design will not dent, scratch, shrink, split, rust or swell due to weather damage or everyday wear and tear. 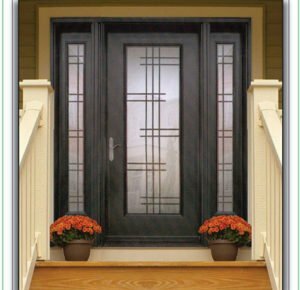 At Window Mart, our fiberglass doors are practical, stylish and affordable. We can custom design them to fit your personal specifications and match the exterior of your home. Fiberglass door are an excellent alternative to wooden doors as they contain high quality weather-stripping, a carving door bottom and a high performance adjustable sill, all of which provide for outstanding insulation. Our friendly staff is always willing to help you with any questions you may have regarding style and selection, customization, financing and installation. Check out our website or call us today to get started! Get started today with a no obligation, in-home consultation for your exterior door installation.